The view down Knickerbocker Avenue. The plan calls for new commercial overlays and makes room for residential, commercial, transit and manufacturing corridors, including Knickerbocker Avenue west of Myrtle Avenue. From its start four years ago, the Bushwick Community Plan hoped to chart a different approach to a neighborhood rezoning: Rather than reacting to a proposal from the city, a set of community stakeholders would come up with its own plan to preserve the neighborhood’s character and affordability in the face of intense interest by private developers. That group—comprised of several community organizations, residents and city agencies—last weekend released its community rezoning plan that addresses housing, zoning and land use, historic preservation, economic development, open spaces, community health and resources, transportation and infrastructure. The limitations of the environmental review process have come up frequently in the de Blasio administration earlier rezonings of East New York, Downtown Far Rockaway, East Harlem, Jerome Avenue and Inwood. Bushwick could mark the first time the official process includes an effort to provide a more realistic view of the good and bad impacts of new development. Process issues aside, housing is at the heart of the plan. Local Councilmembers Antonio Reynoso and Rafael Espinal launched the community planning process in 2014 in response to the community board’s concerns over out-of-context development. As in many areas, residents have grappled with whether it’s possible to allow upzonings in some areas in order to trigger mandatory inclusionary housing without furthering the gentrification of the neighborhood. Recently, residents along with the housing advocacy group Churches United for Fair Housing have held protests outside over a dozen new and proposed developments that have popped up in Bushwick. Churches United for Fair Housing (CUFFH) is one of the groups that participated in the Bushwick community planning process. The comprehensive plan calls on the city to go further on deeper affordability, preserving existing affordable homes, creating new affordable housing through several incentives for property owners and/or developers and expanding tenant protection services and programs. The Bushwick Community Plan’s housing subcommittee’s goals were to prevent the net loss of affordable housing, discourage out-of-context development, ensure that long-time residents can stay in their homes and create access deeply affordable housing for Bushwick residents. The recommendations include the development of new and underbuilt publicly-owned sites as 100 percent affordable housing through the participation of community-based organizations which commit to permanent affordability. The plan encourages higher density zoning for publicly owned sites to maximize the development of affordable units and varied types and sizes of housing units from supportive and senior housing to units that can accommodate small and large families. It has also asked for funding existing and developing new Community Land Trusts and support for programs and proposed legislation that use the tax lien sale for development and preservation of affordable housing such as the city’s Landlord Ambassador program and the bill to create a Preservation Trust to purchase liens. The plan recommends examining options beyond city’s Housing Preservation Development programs such as ELLA and Mix and Match programs. According to HPD’s website, the Extremely Low and Low-Income Affordability (ELLA) program funds the new construction of low income multi-family rental projects affordable to households earning a range of incomes from 30 percent to 60 percent of Area Median Income (AMI), which can range from $22,000 to $73,000 depending on the size of the household. ELLA requires that 10 percent of the apartments in a project are set aside for formerly homeless households and an additional 30 percent of the apartments are affordable to extremely low and very low-incomes between 30 percent to 50 percent AMI, which is estimated between $22,000 to $61,000 depending on the size of the household. The HPD’s Mix and Match program funds the new construction of mixed income multi-family rental projects in which 50 percent of the units are at low income rents affordable to households earning up to 60 percent of AMI, which is estimated between $43,860 to $72,600 depending on the size of the households and the other 50 percent of units would have rents affordable to moderate and/or middle income households earning up to 130 percent AMI, which is estimated between $95,000 to $157,300 depending on the size of the household. The plan goes further to accommodate varied income households and recommends support for programs that help homebuyers earning below 100 percent of AMI, estimated at $94,000 for a family of three, and including support for Espinal’s push to raise the city’s HomeFirst Down Payment Assistance Program grant cap from $25,000 to $100,000. Additionally, it recommends Mandatory Inclusionary Housing options 1 and 3 for maximum number of low income units as well as an increase in funding for tenant rental subsidy programs for severely rent-burdened tenants. Option 1 requires that 25 percent of units are affordable to families making an average of 60 percent AMI, or $56,340 for a family of three; it requires a mix of at least 10 percent of the total units must be set aside for families asking an average of 40 percent of the Area Median Income (AMI) or $37,560 for a family of three. Option 3, the deep affordability option, requires 20 percent of the rent-restricted units in a building to be affordable to families making 40 percent AMI, or $37,560 for a family of three. For property owners, the plan calls for financing and tax benefits for development of permanent affordable housing which exceed minimum MIH requirements and to keep landlords motivated that extend or enter into regulatory agreements through continued offers of finance and tax benefits such as energy retrofit grants and loans. The plan has also recommended support for the creation of the Good Neighbor Program where homeowners can receive tax credits or other non-monetary incentives for keeping rents affordable. There were also recommendations for a “Flip Fee” to impose a steep tax on landowners who resell properties within a certain period of time and for services to help prove tenant harassment in court and discourage unfair buyouts. For long-term property owners, the plan calls on the city to create a homeowner support program for residents that integrates existing homeowner assistance options for one- to four-unit buildings such as loan programs, energy retrofit grants and loans and counseling/foreclosure prevention. For current residents and tenants, the plan calls for increased funding for anti-tenant harassment programs and anti-displacement legal services, and for providing additional long-term funding and training for local organizations that conduct tenant protection activities, legal services, and organizing throughout Bushwick, including in NYCHA housing. to tenants in all regulated buildings and bringing educational awareness for the public through training sessions on how to use online tools such as CoreData and ACRIS. It has also asks for ensuring funding for the North Brooklyn Housing Task Force, which pairs local groups with City agencies to identify and address urgent housing quality and tenant protection issues. The plan also calls for expanding the East New York pilot basement program, which provides a path for legalizing some basement apartments, to Bushwick. Walters says that a third of the housing stock is rent regulated in Bushwick and [rising rents] can pose a challenge for tenants so programs such as Certificate of No Harassment or legal services were important for stakeholders and residents. “I do not think [the community plan] will stop all displacement — it won’t freeze Bushwick but this plan does give Bushwick a voice,” said Walters. The zoning sub committee focused on the preservation of existing residential mid blocks, preventing manufacturing areas from getting a residential rezoning, and limiting increases in residential density elsewhere in the neighborhood exclusively to affordable units. For instance, the plan calls for rezoning to permit no more total market-rate units than are projected to occur without a rezoning, and allows 10- to 12-story R8A buildings on Broadway only if they are 100 percent affordable. The recommendations address blocks where zoning is mixed between between R5B and R6B densities. According to the City Planning website, R5B contextual district permits detached and semi-detached buildings, primarily three-story row houses. R6B districts are often traditional row house districts. The plan says that if a block is predominantly composed of two- to three-story townhouses, which is closer to R5B density than R6B, then R5B should be mapped. The plan calls for new commercial overlays and makes room for residential, commercial, transit and manufacturing corridors, including Knickerbocker Avenue west of Myrtle Ave, which would be zoned C4-3A as Special Enhanced Commercial District (SECD) to require commercial use on the ground floor. Any hotel development would require a special permit. 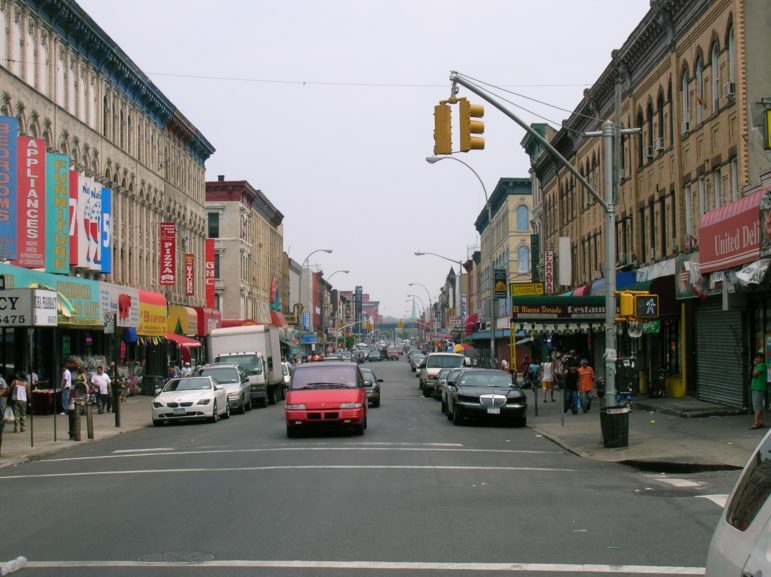 It emphasized that Flushing Avenue and parts of Cypress Avenue must be entirely preserved as an industrial corridor in order to protect the hundreds of industrial and commercial businesses and thousands of jobs located in the North Brooklyn IBZ. For NYCHA residents, the plan recommended that future uses at underutilized NYCHA land must go through a public process, that any new development on NYCHA land in Bushwick must be 100 percent affordable and that existing open space must not dwindle. The plan also calls for more historic landmarking. The blueprint also includes efforts to strengthen economic development with resources such as legal services for locally-owned businesses and the creation of job opportunities for Bushwick residents. The plan suggested using the Small Business Survival Act as a guiding base to establish a city subsidy program to assist local small businesses facing displacement pressures, such as eviction notices, dramatic rent increases, lease renewal uncertainty and landlord harassment. Given the expected influx of residents, the Bushwick community plan also asks for improvements to be made to infrastructure, including traffic safety measures for cyclists, pedestrians, and drivers—specifically along Broadway, Myrtle and Bushwick Avenues. It asks the city to provide additional amenities at bus and subway stations where needed, including seating, shelters, Metrocard machines, and lighting, and for more service on the Z line to help alleviate the burden from shutdown of the L train scheduled for next year. The community plan includes the preservation of existing open space such as community gardens and calls for improvements to large neighborhood parks such as Maria Hernandez Park and Irving Square Park. It recommends giving incentives to developers to create more open space on new developments (public or private). Physical and mental health services and access to healthy food are also part of the picture. The Bushwick Community Plan can be read in detail here. Are the residents of Bushwick prepared to pay for this plan? Don’t try foisting the costs of this silliness on the rest of the City. Bravo to the residents of Bushwick! Of course it makes sense to focus on public health, environmental issues and socioeconomic conditions in considering neighborhood and city plans! Including residents in planning leads to better results and avoids costs that generally get kicked down the road. Ha ha, good luck with this. The City is going to steamroll you with 30 story buildings wherever property owners have spent enough on lobbyists, and at least 14 stories everywhere else. R8A density at a minimum (which is way larger than 12 stories by the way, and will be 75% market rate). That seems to be the pattern. The deBlasio admin rams these rezonings/upzonings through. But the local councilmember in each case also bears some responsibility. They have effective veto power over zoning changes within their respective districts. NYC1000, thanks for the spreadsheet, just curious could you tell me the website this came from I’d like to run it for other communities to make them aware of who’s responsible of the changes. Thank you very much. NYC1000 thanks for your comment could you tell me where I can get this list from? I’d like to do it for other communities. Thank you.